The Chamberlock as it appears in Portal 2. The Chamberlock is the room at the end of each Test Chamber that contains an elevator leading to the next one. The Chamberlock is the most common fixed-end goal of any test chamber, and its entrance is always covered by a Material Emancipation Grill to vaporize any unauthorized objects that pass through and remove any previously-placed portals. Chamberlocks appear in most levels of both Portal and Portal 2. Chamberlocks in Portal are some of the smallest rooms in the game. For the most part, the chamberlock is a white, circular room with slatted walls. In the center is an elevator, which the player walks into in order to continue to the next chamber. Portal 2 brought several changes to the design of the chamberlock. 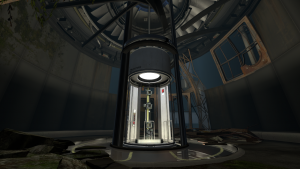 Unlike the chamberlocks in Portal,the chamberlocks in Portal 2 are a great deal larger than their previous rendition, with the player being able to move freely around the central elevator. The elevator itself has undergone a change, with the player movement inside it much more restricted and with glass walls. A completely new addition to the chamberlock is the display-capable walls, which display video that can either display procedures for apocalyptic circumstances, or if a new element/mechanic of the game is introduced in a test chamber, for example, the Sentry Turret, it can display how the element is made. Sometimes these displays correspond with the Announcer's voice lines. Note that not all chamberlocks in Portal 2 are the same, as the chamberlocks of the older Aperture Science facilities were similar in size and construction to those of Portal. The view of a Chamberlock as seen from the elevator in Portal 2. The Chamberlock as it appears in Portal. There are several informational videos that play in the Chamberlocks in Portal 2. This page was last modified on 30 January 2019, at 14:37.